The game on Saturday morning started with Lady Tigers pushing across 1 run in the bottom of the first with a Maggie Schandera Triple. Kaitlyn Bennett as a courtesy runner for Schandera scored on a Bella Henson single to give Dawson the lead. It wouldn’t take long for the Lady Rebels to put up 1 of their own. The top of inning 2 Fannin tied the game at 1 each. The 1-1 score held until the top of the fifth with Fannin scoring 1 on a double by Waldrep and a 2 out double by Russell to gain the 1 run advantage. With the Lady Tigers being held to 1 run through the first six innings the defense gave up 1 in the fourth and 4 in the fifth lifting the score in favor of the Lady Rebels to 6-1 into the 7th and final inning. With a last inning effort Dawson fought for 2 runs making the final score 6-3 and a win for the Lady Rebels. Both the Lady Rebels and the Lady Tigers put up 8 hits in the game with the Dawson defense committing 5 miscues and aiding in unearned runs crossing the plate for Fannin. Maggie Schandera threw 80 pitches in her 7 innings of work. The Lady Rebels scored 6 runs(1 earned on 8 hits) and struck out 3 times as they faced Schandera. 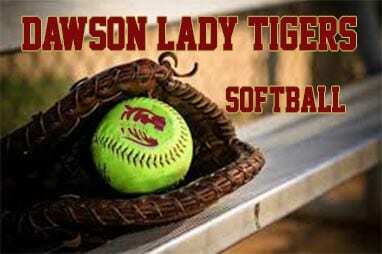 Offensively for the Lady tigers, Carol Drake was 2 for 4 and 1 RBI to lead the Dawson batters. Schandera, Henson, Martinez, Martin and Tow all had 1 hit each in the 6-3 loss to Fannin. Game 2 against Fannin was played after a brief brake for both teams.